You know there's a difference between template-based, and custom-designed websites, but you might not be sure of ALL the things there are to consider, or the questions to ask. Having worked with both, we can give you the pros and cons of using a template instead of getting a custom designed website. We know the differences because we do both custom, and template-based, websites. And there are reasons to use one instead of the other. This one is pretty obvious: template-based websites cost less because the design is already done, so you'll save a bunch of money in the design process. And there's lots of really nice templates on both SquareSpace and Wix, that are already designed and coded to be mobile-friendly. If your company is truly unique, a template won't show that as immediately as a custom designed website will (assuming you pick a web design firm that does awesome custom web design). Your website will look like other websites that use the same template. Of course, the chances your competitors will be using the same template is probably slim. Also, templates only use white backgrounds so you lose the opportunity to use textured backgrounds that make custom websites look so rich. See SSK Plastic Surgery as an example of textured backgrounds throughout the website. Simple to use means more inexperienced people can build websites with templates. Since more inexperienced people are building them, those folks don't know how to troubleshoot technical issues, nor how to customize a website. So when an inexperienced web designer runs into a problem, it could be a big problem for you. Because templates have limits for how customizable they are, there's a distinct possibility you’ll eventually want to do something a template can’t do. It's hard to say what that will be, however, at that point it's going to be frustrating that your website won't do what you expect it to, or want it to. Since we know how to code websites, we can "hack" the code in a template-based website to troubleshoot problems and add background colors/textures. See Metta Psychology Group's website as an example of a template-based website we did that for. This is why the Metta Psychology website we built in SquareSpace is better than the default template. We took the best of what templates offer (cost-savings), with the benefits of a custom-coded website, which gave Metta Psychology a one-of-a-kind SquareSpace website. Online templates only let you use 3 or 4 different typefaces. Once you get into the design, you'll find those can be fairly inadequate. With custom websites you can do so much more with type options and placement on the pages. SquareSpace and Wix will tell you they have websites that show up well in Google searches. From what we can see, that's the exception, rather than the rule. Going the inexpensive (template) route means you'll be giving up the much better SEO custom websites offer. Websites built in Drupal or WordPress. If you're not as worried about being found on the web for people searching for what it is you do, then templates are fine. SquareSpace and Wix will definitely tell you (on their websites) that they build SEO-friendly websites. Those website template just don't give you the ability to place unique Page Titles and Meta Descriptions on every page, which is critical for SEO. Want to know what Page Titles and Meta Descriptions are? Watch the first 40 seconds of this video and you'll know how important Page Titles and Meta Descriptions are. 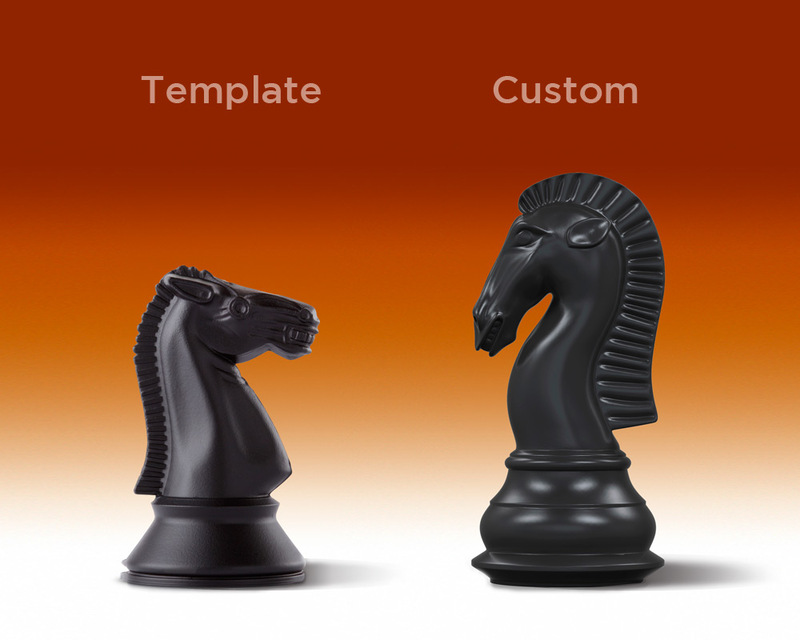 To read more, check out our blog on templates versus custom website design here.